I'm back again with Newman's Own! As part of the Foodbuzz Tastemaker program, they sent me a goody box filled with Newman's Own products and coupons, plus a flip video camera to record a video recipe! I had thought about what I would make, something that can be prepared in about 30 minutes. The final decision was a breaded chicken cutlet with a quick pan sauce using Newman's Own vinaigrette. I tested the sauce out with the Caesar vinaigrette first and that's pretty tasty, though I featured a pan sauce with the Light Raspberry & Walnut vinaigrette for the video. It's versatile, so feel free to use the flavor that you enjoy the most. 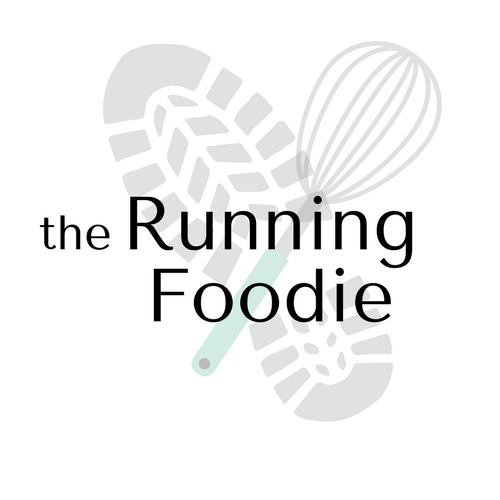 This is also the first official video recipe ever shown on She Runs, She Eats. Enjoy! You might think that it's difficult to make breaded chicken cutlets, but it's not as time consuming as you might think. Pounding the chicken speeds the cooking time so you'll spend about 12 minutes cooking the chicken. You can even pound the chicken ahead of time and keep it in the fridge until you need it. 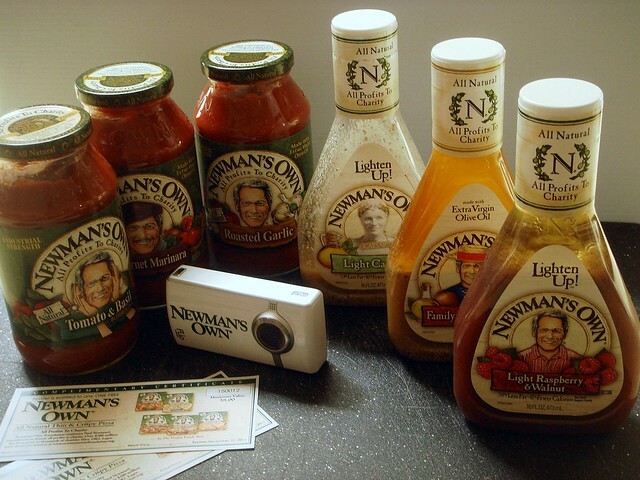 I will be incorporating the remaining Newman's Own products I received in different recipes. The side dish in the video is a tasty and quick orzo pilaf using the Light Caesar vinaigrette. That recipe will be posted later this week. Preheat oven to 200 degrees. In a bowl, mix yogurt, milk, flour, salt, cayenne pepper, and black pepper. Place bread crumbs and flour in a shallow dish, such as a pie plate, and stir to combine. Working with one piece of chicken at a time, dip into milk mixture, letting excess liquid drip off. Dredge both sides in bread crumb-flour mixture and place on a platter. Repeat with remaining chicken. As you bread the chicken, heat 1 tablespoon olive oil and 1 tablespoon butter in a large skillet over medium high heat. Place two chicken cutlets in the pan and cook for 3 minutes or until the underside is golden brown. Flip and continue cooking for another 3 minutes. Remove to an ovenproof platter and place in oven to keep warm. Add remaining olive oil and butter to skillet and cook remaining chicken pieces. Reduce heat to medium. Add vinaigrette to skillet and let cook until reduced to a glaze, about 30-45 seconds. Remove from heat and add goat cheese, stirring with a whisk to blend into sauce. Stir in parsley. To serve, divide sauce between four servings, pouring over the chicken cutlets. Great video! And a fun recipe. The pan sauce you created with the dressing and the goat cheese looks really delicious. Thanks for sharing! 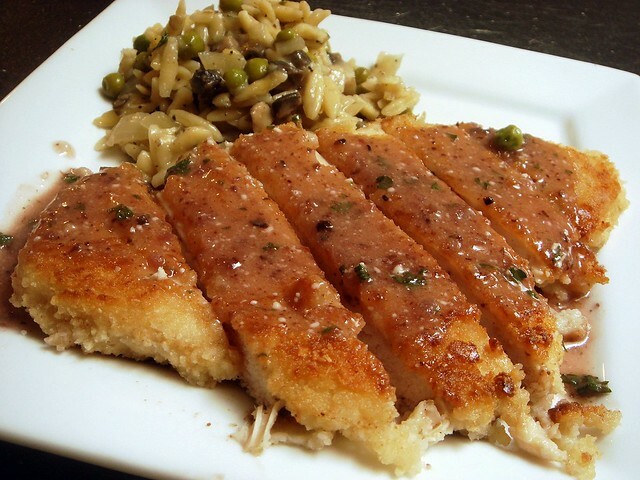 Nice recipe such a great twist for a chicken cutlet. Nice video too. Oh, the chicken looks awesome!